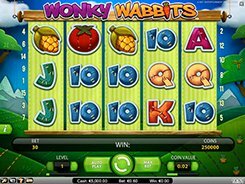 Go Bananas is a 5-reel slot with 20 fixed paylines and is themed around monkeys. 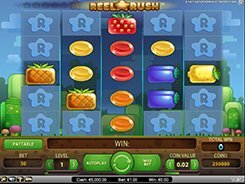 You can adjust a coin size from $0.01 and $1, and place 1 to 10 coins per line, so the minimum and maximum bets are $0.2 and $200 accordingly. The symbols are fruits, jungle books, drums, gems, etc. 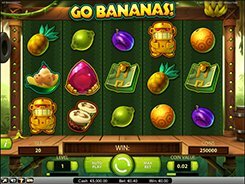 Go Bananas has an excellent feature that adds loads of fun and fairly big wins to your gameplay. There are five Wild Monkey symbols in the game. Whenever any of the five wild monkeys lands on the reels, it will transform itself and some of the adjacent symbols into wilds according to an individual pattern. 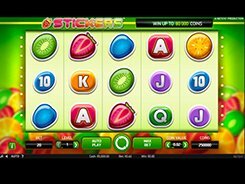 For example, Wild Orangutan will make 4 adjacent symbols wild in a 2x2 shape, Wild Baboon will morph the entire reel into wild, and Wild Tarsier will turn two symbols into wilds either vertically or horizontally. 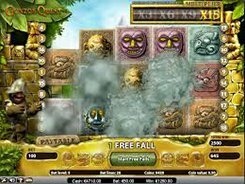 There are no scatter symbols or free spins in the slot, but a variety of wilds offsets the downside. 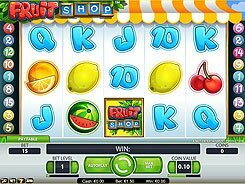 The top jackpot prize you can win in Go Bananas is x700 times a line bet which is a cash equivalent of $7000 if playing at max.